A lot of hard work goes on in the Recording Studio, but students enjoy the collaboration. Last of a series previewing Canyon Worship 2018, which will be available for $9.99 on iTunes, Google Play, Spotify and Shazam and in the Lope Shop on campus beginning Monday, Sept. 10. You would think it’s intensely competitive. 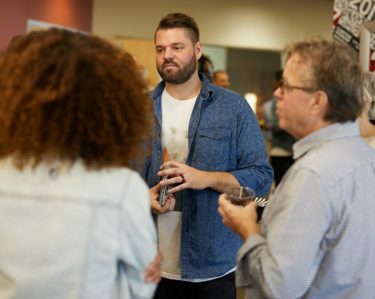 You would think the students in the Center for Worship Arts at Grand Canyon University constantly are trying to one-up each other when it’s time to decide whose song will be chosen for a Canyon Worship album. The studio has become a home away from home for many Worship Arts students. You would think they aren’t overly eager to help each other with lyrics or music, that they tend to reserve their best work for themselves. 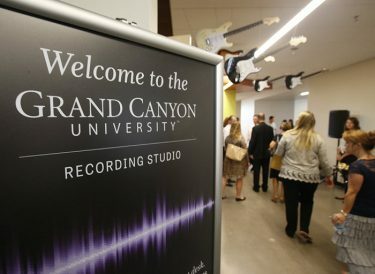 “When someone is truly in service to God, the world’s metric of success seems to fade away into the noisy background,” said Eric Johnson, who manages the GCU Recording Studio and sees the vibe in action all the time when students gather there. Interviews with the student artists on Canyon Worship 2018, scheduled to be released Monday, produced the same sentiment over and over. What keeps coming up is how much they care for each other – and especially for newcomers. Katie Brown and Logan Myers both talked about what it was like for them when they first came to the Recording Studio. They appreciate how they were made to feel comfortable and included. “I really didn’t know very many people and I’m very shy. I was afraid of not making friends,” Brown said. “But the way the classes are formatted and (with the culture) the community creates in the studio, there are a lot of shared interests. 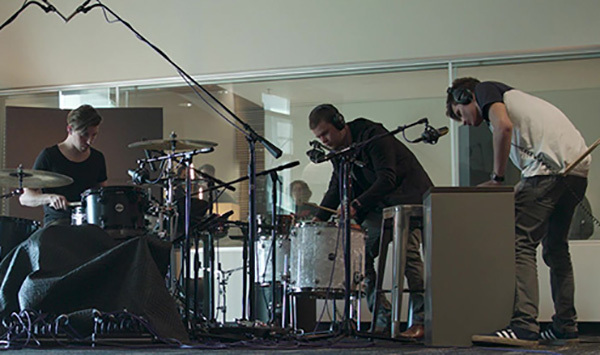 Logan Myers (second from left) and Chris Calderon (with guitar) both found the Recording Studio culture welcoming. Myers overcame her reticence by just coming to the lounge to eat or do homework and spending all of her free time there. She grew comfortable with the scene: Someone playing guitar and groups of students collaborating and singing. Chris Calderon got to GCU a year ago, coming all the way from Chicago. Now he’s so comfortable up in the studio, located on the fourth floor of the Technology building, he feels like an old-timer. “I always like to tell people, it’s like the first-century church,” he said. “We have this area we can come to and gather, but what we have out there in the lounge, it travels wherever we go. Having this area helped us cultivate that culture like the first-century church where we’re eating together, praying together, doing Scripture, growing in our relationship with God. It wouldn’t work if some of the students had big egos. It wouldn’t work if they thought it was all about them. 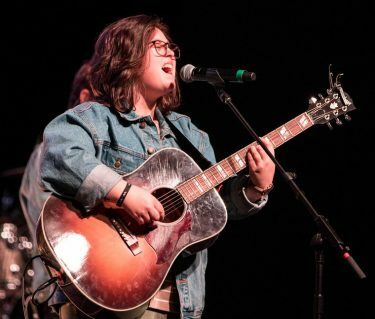 Mallory Denson said the Worship Arts program changed her life. She just was named the Worship Director at Paradise Church in Phoenix. “There are extremely talented people here that don’t parade it around,” Courtney Welker said. “They’re very humble with their talents. It’s a place where it’s easy to grow because you’re challenged by these humble peers that are really gifted and you realize you could be like them – you could be better by honing your craft – but there’s never pressure to be like them in particular. Or just hone their life. Mallory Denson had been through some challenges in Mississippi, where she grew up, before arriving at GCU. “Oh man. It changed my life,” said Denson, who graduated in April and this week was named Worship Director at Paradise Church in Phoenix. “The Worship Arts program in general completely – just having professors who were so intentional and so helpful to your spiritual life, not just academically. “GCU completely made me secure in my calling, made that affirmation happen in my calling, especially when I got onto the Worship Team as a worship leader. That grew me so much. I knew what my calling is, but it grew to where I was completely sure what I was supposed to be doing with my life. But here’s the thing: It’s not as if collaboration is required or pushed on anyone. It just happens. And if students want to work alone on a song, they can do that, too. 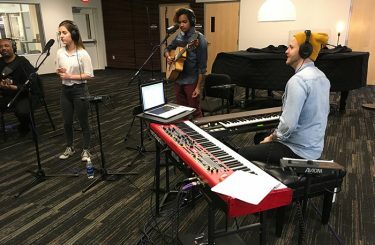 Co-producers Geoff Hunker (center) and Billy Smiley (right) love working with the Worship Arts students — and love the atmosphere in the Recording Studio, too. “I think it’s a really healthy mix of both,” Aaron Bolton said. “I think I come up with some of my most personal ideas by myself, but at the same time I think it’s really helpful, especially as you’re starting out songwriting, to just get with somebody else who can complete your idea. The co-producers of Canyon Worship 2018, Geoff Hunker and Billy Smiley, feel the vibe, too. It’s not hard to pick up on it. It makes their job easier. But they’re trying hard not to be jealous. That, after all, would be wrong. And the Recording Studio is just not a place for a bad vibe.